Want to catch a glimpse of the first (or last) rays of the sun in Delhi? Here are some of the best spots in the capital for some spectacular views. You may have been to the Hauz Khas lake, accessible from the Smokehouse Deli side of HKV, and seen people taking leisurely strolls. Visit this spot in the AM or when the sun’s going down, and watch the sun’s reflection come alive in the water. You can also perch yourself on the monument ruins for a more panoramic view. This might sound a bit arbit, but given JNU’s massive open spaces, it’s not that surprising. Provided the sky isn’t cloudy, you can watch the sunrise or sunset over the stadium at JNU, while also getting a view of a large chunk of South Delhi. When you see the sun rising or setting behind the Lotus Temple, be prepared for a burst of colour in the sky. The silhouette of the flower-shaped temple only adds to the experience, making it an almost surreal sight. The last refuge of Mughal emperor, Humayun, the tomb is more of a palace. The beauty of the Persian architecture is further enhanced when the sun is going down; it covers the beautiful structure in a warm glow. 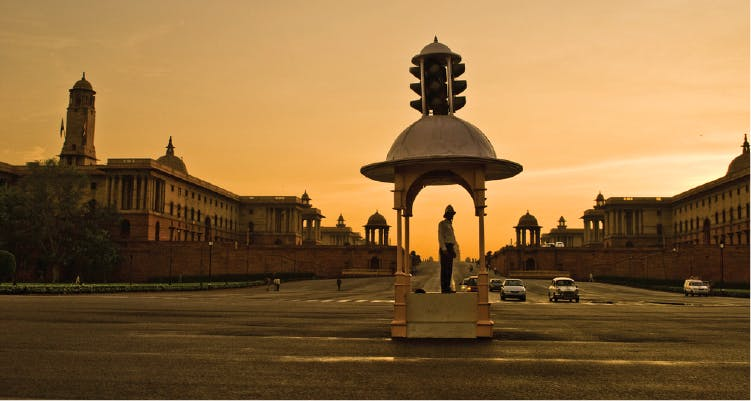 If you’ve been on a drive around Rashtrapati Bhavan down the curvy road, you know what we’re talking about. Next time, time your cruise with the sunrise or the sunset to catch perhaps one of the best views in the city. You can climb onto the elevation and feast your eyes on the orange and red hitting the sky. The sun rising over, or setting into a large body of water is always a mesmerising sight, and the Yamuna river is no exception. Plant yourself on the bridge, gaze into the horizon and watch the spectacle unfold. This is considered to be one of the most haunted spots in the city. But if you’re still willing to pay it a visit, we say time it with the sunrise for an interrupted view of the rising sun amidst foliage and critters, away from the concrete jungle we live in. Bound by JNU, Mehrauli, NH8 and the Palam Road, Aravalli Biodiversity Park is another foresty area free of civilisation. Boasting of diverse flora including a wide deciduous patch, the sunrise here is spectacular.